The 450D was introduced in January 2008. $50 for XSi w/18-55 IS & 55-250 IS. February 21st Despite lots of expectations that the 500D would be announced for PMA – the 450D shows no signs of retirement. Fixes a phenomenon in which AEB (Auto Exposure Bracketing) shooting does not operate normally under specific conditions. Fixes a phenomenon in which the Live View exposure simulation warning indication does not properly display during Live View shooting. Fixes a phenomenon in which images cannot be played back after continuous shooting when a printer is connected to the camera or a video output terminal is used. Version 1.0.9 firmware is for cameras with firmware up to Version 1.0.4. If the camera’s firmware is already Version 1.0.9, it is not necessary to update the firmware. June 17th Prices continue to fall, with UK prices down to ~£420. The price of the new 1000D isn’t certain yet. May 23rd Detailed DPR review link added above. 14th The rebates are listed on the 5D2 page – no 450D rebate, but plenty of lens ones. 20th More sample images (thanks) at different ISO settings at DCW and a note that Adobe have pulled the updates listed below. 14th Adobe have also released new versions of Camera Raw and Lightroom and DNG Converter to support newer cameras. 12th Some purported high ISO 450D images on a German forum. 8th Most people are still vaguely pointing to some time in April for having the 450D in stock, but I’m told (thanks) that Komplett in the UK claim to have 3 in stock for the 8th of April. February 26th On Canon sites, it’s still saying ‘March 08’ for arrival, although later in the month is best bet at the moment. …then it most likely is. If you are unsure of a company, a look at places like resellerratings.com is good for searching which are complete rip-off merchants. Another good way is putting the company name and ‘scam’ into Google, since this will find forum discussions where people are complaining. Note too that you can always click on the ‘ads by Google’ text and complain to Google if you find an ad particularly offensive. 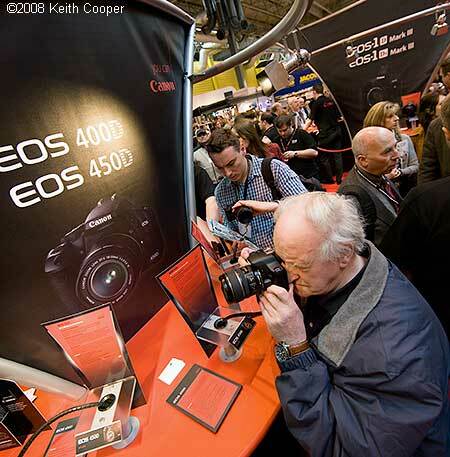 25th Lots of people took the chance to have a play with the new 450D at the Canon stand at the Focus show in Birmingham. 1st No reduction in image quality… Moving from 10 to 12 has not reduced image quality says Chuck Westfall in this PMA video from ImagingResource. January 25th Canon UK had some web problems earlier, but the 450D info is now on their site, the 450D info can also be found at their Ireland site. 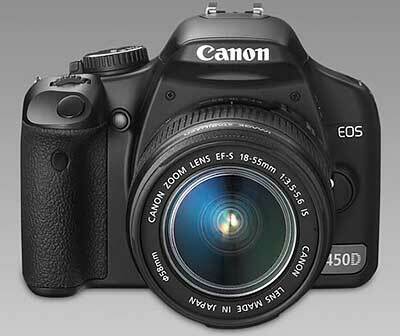 24th As expected it’s the 450D and it gets the XSi designation in the US and EOS Kiss Digital x2 in Japan. It’s interesting to see that liveview AF is now available in either normal AF (mirror drops down) or contrast based. Note also that you’ll need new SD cards – no more CF …and no video mode. 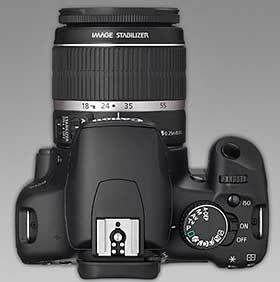 The normal 450D kit includes a redesigned, image stabilised version of the 18-55mm f/3.5-5.6 lens. This should help it compete with the increasing number of other makes of DSLR which offer sensor based anti-shake systems. Lots of useful upgrades, whether it will hold out against the expected rush of entry level DSLRs this year will make for some interesting comparisons. Available for the first time on a Canon consumer D-SLR, Live View mode makes it easier to shoot from awkward angles, such as ground-level macro shots or when shooting from a tripod. The image from the Live View mode is displayed as a smooth, 30fps video feed on the 3.0” LCD, which is 50% brighter than the screen of the EOS 400D. A grid line display and live histogram can be selected to help with shot composition and exposure. 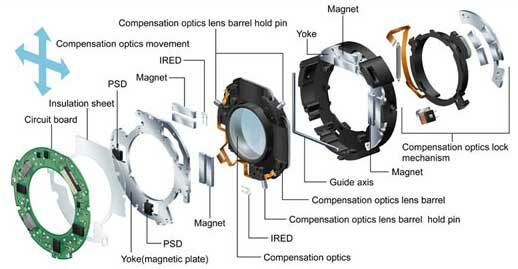 While focusing, the photographer can zoom in on specific details with up to 10x magnification of the image displayed on the LCD screen. Two types of auto focus are available: Quick AF flips the camera mirror momentarily to engage the AF sensor; Live AF uses the image contrast data to focus – a method familiar to anyone upgrading from a compact digital camera. At first glance, one notices the Rebel XSi’s large, 3-inch LCD monitor, enhanced from the 2.5-inch screen on the Digital Rebel XTi model. The larger 230,000 pixel screen makes it easier for users to review images and scroll through the Rebel XSi camera’s menus. The larger-sized display provides the ability to use a larger font size for menu text, making it easier than ever to read settings and options. The new screen also features a broadened Colour gamut, seven brightness settings for easy viewing under a variety of shooting conditions and a wide viewing perspective in all directions. Another image quality enhancement is the upgrade of the Analog-to-Digital (A/D) conversion process to a 14-bit A/D processor. The inclusion of the 14-bit A/D process means the Rebel XSi camera records up to 16,384 colours per channel and allows the camera to produce images with finer and more accurate gradations of tones and colours. This is ideal for shooting outdoors where subtle hue changes in sky, water or foliage can really add to an image. If the 12.2-megapixel APS-C size CMOS sensor is the heart of the camera, then Canon’s DIGIC III processor is the brain. The latest generation of Canon’s proprietary image processing engine, DIGIC III technology ensures that the fine details and natural colours of the images are optimally recorded. The DIGIC III processor also manages the camera’s efficient energy consumption and high-speed signal processing performance. 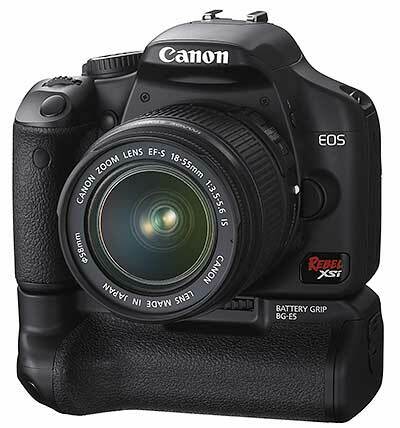 The EOS Rebel XSi is the first model in the Rebel series to incorporate DIGIC III. The EOS Rebel XSi Digital SLR utilizes a precise nine-point Autofocus (AF) system featuring a newly developed AF sensor that improves the camera’s subject detection capabilities compared to earlier models. The new Rebel XSi DSLR provides a cross-type AF measurement at the centre that’s effective with all EF and EF-S lenses, while providing enhanced precision with lenses having maximum apertures of f/2.8 or faster. 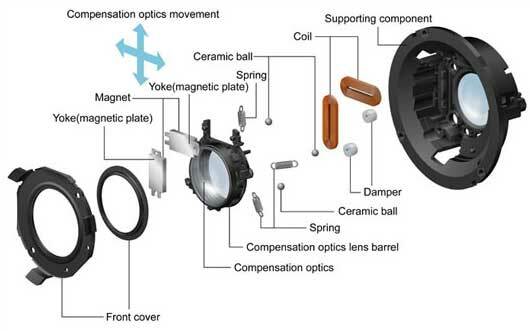 The cross-type AF measurement reads a wider variety of subject matter than conventional single-axis AF sensors and thus increases the new camera’s ability to autofocus quickly and accurately. The EOS Rebel XSi is also the fastest firing Rebel model to date, capable of continuously capturing 3.5 frames per second for bursts of up to 45 images in large/fine JPEG mode and 6 frames in RAW mode. The faster frame rates and finer focusing capabilities of the Rebel XSi together with its impressive image burst rate will help photo enthusiasts preserve family milestones or capture split second sports action at just the right moment. 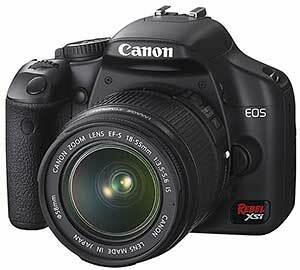 Sydney, 24th January 2008 – Let your creative juices flow with Canon Australia’s new EOS 450D digital SLR camera. Positioned between the highly acclaimed EOS 400D and 40D, the new EOS 450D successfully establishes its position as the camera of choice for first time digital SLR camera buyers who are seeking more creative control than previously offered in entry-level digital SLRs. Exceptional clarity, razor-sharp images and rich colours are all the hallmarks of a Canon-developed 12.2-megapixel CMOS sensor. Combined with the imaging performance and super-fast speed of the DiG!C III image processor, the EOS 450D is the perfect camera for creative photography fun. 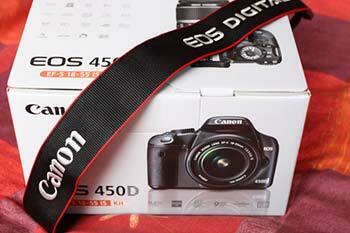 Canon’s EOS 450D also brings photographers a host of functions for users looking to expand their scope of photography. The addition of Live View Mode with Auto Focus capabilities allows photographers to preview images in real time for greater flexibility and creative composition. 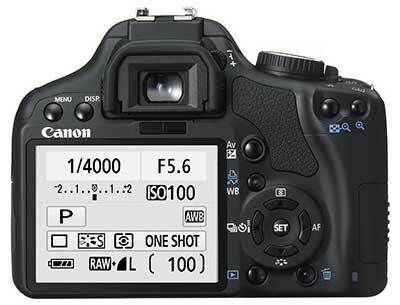 The EOS 450D is perfect for first time DSLR users. With a large 3.0-inch LCD monitor and a Mode Dial for selecting automatic modes such as Sports, Portrait or Landscape, the camera optimises the settings for particular situations and conditions, offering built-in expertise to assist the photographer in capturing their best shot. The EOS 450D can also be set to Full Manual mode, enabling even greater creative control. Up until now, dust has presented a challenge to capturing the perfect image. The EOS Integrated Cleaning System ensures total protection from the appearance of dust in images when shooting in adverse conditions. 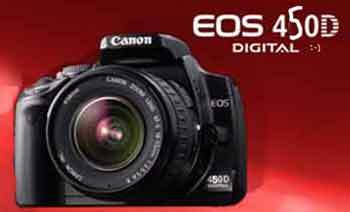 Smaller and lighter than the EOS 400D, the EOS 450D is the ideal size and weight to ensure it can be taken anywhere. A faster start up time of 0.1 seconds also ensures users won’t miss a moment when an unexpected photo opportunity arises. The EOS 450D is the ideal companion for users looking to experiment with photography, pushing their creative boundaries to the next level and assisting them to produce images that are uniquely their own. Anything is possible with the EOS 450D which is set to inspire and encourage imaginative photography. As to actual ‘solid’ rumours, I’ve yet not seen anything relating to the predicted Canon announcements on Wednesday. BTW I always wondered why Canon marketing didn’t use the XXXD model number designation in the US? 11th Nothing new, not even the fake books and pictures from before the 400D launch. 26th In another outbreak of “We’ve seen a bar code, so it must be true” news, a Chinese site is mentioning both the 70D and 320D. That said, given that PMA is shortly afterwards, many -are- expecting a 5DMk2 and 450D. 9th With XTi body only prices (US) of ~$510 there have been further downward shifts in pricing (Amazon $590 with kit lens). 1st 400D prices seem to be dropping, which is often a sign of a ‘clearout’. 5D prices have been coming down quite some time now, so the expectation still seems mostly for a new 5D and 400D announced at or just before PMA. PMA (exhibitor list) runs from Jan 31st to Feb 2nd. The 450D is due in early January 2008 for PMA. The 400D has been the DSLR mainstay for Canon for the last 12 months, dominating the market and the new model is expected to continue this. Canon is adding a range of ‘gee whizz’ features to maintain this. Ease of use software changes with things like the facial recognition from the consumer P&S targeted for both exposure and focus management. The software final feature list will depend on what they get working well in the DSLR environment. The Nikon D40x is seen as new and not likely to go to 12mp for a while. However the Nikon D80 is expected to be upgraded next year with a D80x or equivalent taking it to 12mp, live view etc. The design of the IS in the two new lenses is not the same as in existing IS lenses, whilst details are missing, these two pictures compare the new IS and older design. Canon says that the new version is ‘as good as’ the old. 18th The 450D (or whatever it gets called) is slated for early next year. We received a whole load of Canon info that suggests: March 2008. 14 bit, Digic III, highlight preservation and IS lens as standard. 8th At last a 450D rumour, but it’s on DPR and is actually more about the 40D expected later this month. June 21st 400D rebate has been extended (Canon info) until the end of August. 7th The suggested 18 month consumer update cycle puts the 450D release at PMA in 2008 (Feb). If a 40D does get announced with a bigger sensor size this summer, expect the larger sensor to make it into the 450D in the Spring. One thing that could affect the timing is a 5Dmk2 release. Check out our 40D page for current Euro rebate offers. Shutter speed: 1/4,000 sec. – 30 sec., Bulb; maximum flash sync at 1/200 sec. Focusing method: TTL-CT-SIR type. Wide area AF with 9 selectable focussing points.